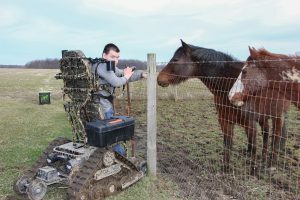 WAKEMAN, Ohio — As Austin Yaworsky rounded the corner of the barn on an unusually warm, sunny February day, the tracks of his new Action Trackstander pulled him across the soft, wet, ground with ease. No longer is Austin spinning his tires, waiting for a parent to free him. And the mud-covered tracks of his new chair show the mileage he has already gotten out of his chair since Christmas. Austin was born with spastic diplegia, a form of cerebral palsy that affects his lower body and some of his fine motor skills. The standard power chair Austin was using to get around the family farm would get stuck in the smallest of puddles, and require assistance from a family member to push him out. His family owns a 155-acre farm in Huron County, raising around 110 acres of corn and soybeans. Austin raises beef cattle on the additional pasture land. 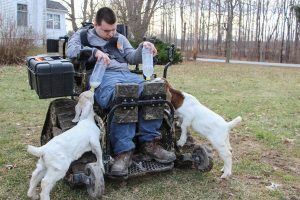 Austin Yaworsky’s market Boer goat operation recently grew with the addition of two new kids this winter. His new Action Trackstander makes it easier for him to get out to the barn and help feed the new goats. 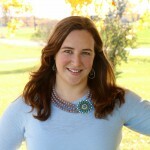 Charlie Landis, rural rehabilitation coordinator for Ohio AgrAbility and Easterseals in Cincinnati, first met Austin in March 2016. 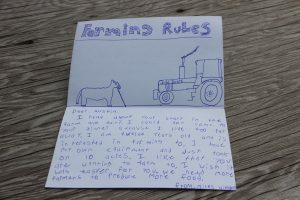 “His main goal was getting the track chair.” At that time, Landis explains, there was not much AgrAbility could do except to help them write a letter to their insurance carrier. For more information on the USDA AgrAbility program, click here. For more information on Ohio’s AgrAbility program, click here. For more information on Pennsylvania’s AgrAbility program, click here. Ohio AgrAbility is a resource for technical support and education for people with disabilities involved in agriculture, explained Landis. “We don’t have the funds to provide equipment,” he said, but they work to find grants through partners like the Opportunities for Ohioans with Disabilities (OOD) or the Bureau of Vocational Rehabilitation (BVR). AgrAbility is funded through USDA as a four-year grant through the farm bill. Twenty-one states have a funded program through a land-grant university partnered with a nonprofit disability organization. For example, Ohio State partners with Easterseals and Penn State partners with United Cerebral Palsy of Central Pennsylvania. Landis said AgrAbility is asked to do the farm assessments for people with disabilities and give their recommendations” to partners like OOD or BVR. Most general disability organizations deal with office or home settings and are not familiar with farm settings, he added. “We will break it down for them: what do (farmers) do and how that equipment will help them continue farming,” said Landis. The main goal of AgrAbility is to promote success in independence for farmers who have experienced an illness or disability, he said. Austin can usually be found along the fence rows, visiting with his animals, or powering through mud holes that once slowed him down. Since getting his track chair, Landis has been back out to the farm to perform an assessment with the Yaworskys, and see what else can be done to make the farm more accessible for Austin. The Action Trackstander is much wider than his old chair, which means they will need to widen barn doorways. The Yaworskys want to use a sliding door on the front of the barn to make it easier for Austin to open. 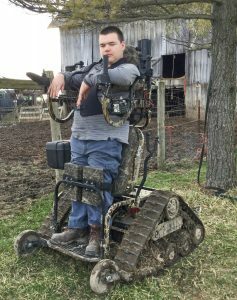 Austin does have experience driving a tractor, said Landis, and the Yaworskys are looking into lifts that attach to the tractor to help him get in and out. When Austin was younger, his parents would help lift him in and out of the tractor, but that is not as easy to do anymore. They are also looking into a step rail lift to assist him in and out of the family’s SUV. “Pushing him in and out of the SUV not only takes a toll on his parents, but it’s also a dignity thing for Austin,” said Landis. Austin also doesn’t have fine motor skills with his hands, Landis said, so closing and opening gates with standard latches is a challenge. As a result of Landis’ assessments, the Yaworskys are looking into quick release latches. They also discussed automatic feeders and a flex auger system that would make it easier for Austin to get grain into the barn and feed his animals. “When it comes to the world of disabilities, (the disabled) need more equipment, but the cost is high,” said Landis. Angie Yaworsky, Austin’s mother, said they have been overwhelmed by the response from the community and beyond. 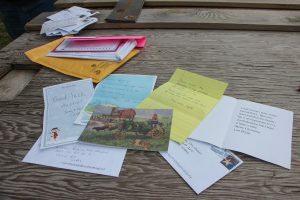 They have received around 50 letters, many from Farm and Dairy readers, offering words of encouragement and donations toward his chair. Farm and Dairy readers reached out from all over to show their support for Austin. Angie Yaworsky said the family received over 50 letters. Several people read Austin’s story in that auction barn and donated proceeds from their sales to Austin’s cause. One gentleman offered his entire egg check for the week, said Dilgard. “He heard me get to talk about Austin and said ‘Hold my egg check and cash it and give it to Austin’,” Dilgard said. Dilgard and his wife made the trip to Wakeman, Ohio, to meet Austin at the Western Reserve FFA benefit and give him the money they took in at the sale barn. “Austin had a goal, and the FFA, they took the bull by the horns,” said Dilgard, who truly appreciated the community spirit surrounding Austin and his family. With the funds, the Yaworskys were able to afford the chair and the traveling cart to load his chair onto their SUV and set some money aside for future investments in Austin’s journey. “They told us to set aside some money for a battery” which costs around $1,000 to replace, explained Angie. If used well — which the Yaworskys know it will be — the battery will need replaced in a year’s time. 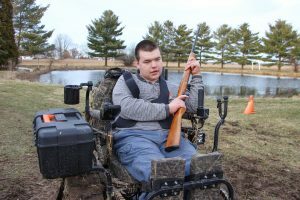 Austin was very excited to go squirrel hunting with his cousin shortly after getting his chair — something he hasn’t been able to do in a long time. A special gun holder on the side of his chair allows him to hold the gun steady while he shoots. The gun he is holding was passed down from his grandfather, who passed away late last year. Now, it’s even harder to keep Austin indoors when the farming world is so much easier for him to navigate. “We’ll find him out here at one of the fences, just standing there, looking at the animals and playing with them,” said John. This year, Angie said they will be putting him to work, halter breaking the new calves they expect to have this spring. “He’ll be able to get into the pasture no matter what the weather is,” said Angie. And Austin couldn’t be more excited to do it. Austin will also be starting a new job at a poultry operation, separated from his family’s farm by just a field. They haven’t worked out all the details, but Austin will most likely be sorting eggs. And the best part is, he can get there himself — by track chair. Thank you for your story of my cousin Austin. He is a wonderful young man with a great future. To everyone that has helped him a huge thank you from his family. He loves his chair.